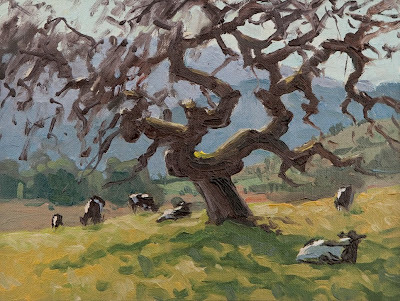 A small herd of young Holstein heifers kept me company as I was painting this study. Some of them were posing for me as you can see, but most of them were behind me and beside me watching me paint. Some came as close as a couple of feet to get a good view; they were very curious. One of them had a cough, poor thing. This was a perfect setting for a picnic. Study 8x6, oil on linen.